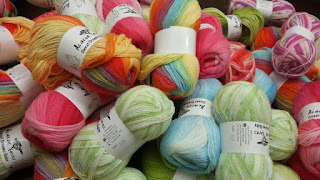 Yarn and Fiber Happenings: New Colors, Colors, Colors! Hot New Cool T-Shirts and Quick and Easy Mittens for Summer Projects at the Yarn and Fiber Company! New Colors, Colors, Colors! Hot New Cool T-Shirts and Quick and Easy Mittens for Summer Projects at the Yarn and Fiber Company! Enjoy 15% off the Ivy Brambles Knitting with Friends lines including the Hot New Tie-Dyes that welcome summer with gorgeous swirls and witty sheep, yaks and alpacas! New colors have arrived including Wildflowers, Flight, Festival, Tidepool and Dark Nebula... Each unique shirt has the witty sheep either just chilling with friends or spinning up their ram or working for insomniacs helping them get to sleep! These shirt are a must have for you and your group! These t-shirts are also available in solid colors! Get yours today! Many have started their collections and I have seen lots of these shirts being worn at trade shows! So, whether you are a knitter, crocheter, spinner or quilter, there is a shirt for you! All shirts are 100% pre-shrunk Tie Dyed Cotton and found in the Apparel Category at YarnandFiber.com. Sales runs through the end of May and includes all Knitting with Friends, Spinning with Friends, Hooking with Friends and Quilting with Friends Shirts, Tote Bags, Greeting Cards and Needle Gauges. Enjoy! Guess what we just realized! The new and lovely silk and wool Ivy Brambles Desire works up great for chunky mittens. AND.... each skein makes two PAIRS of mittens. These mittens work up in hours and are perfect for gift giving! They are fun, funky and warm while giving you a small project to work on during the summer months! Check them out in Petunias! Very pretty and irresistible! New colors have been added to the line - including Petunias, Sunrise, and Dayglow! Spectacular! 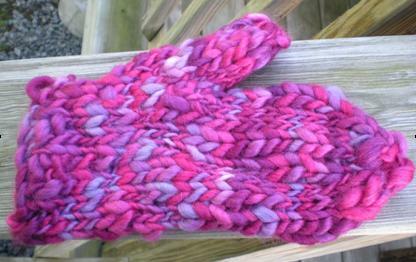 And the Ivy Brambles Super Bulky Mitten Pattern is the perfect pattern for these fantastic mittens! Enjoy all the beautiful colors and always be happy with your projects! Happy Fibering!